On July 28, 2016 at the Democratic National Convention in Philadelphia, Pennsylvania Hillary Clinton accepted her party's nomination for the office of President of the United States. Charles "Buddy" Roemer, a Republican, served as Governor of Louisiana from 1988 to 1992. Prior to that time he served in the U.S. House of Representatives from 1981 to 1988. It was while serving as Governor in 1991 that Roemer switched his party affiliation from Democrat to Republican. Roemer initially sought the presidential nomination in 2012 from both the Republican and Reform Parties. He eventually withdrew and ended up endorsing Gary Johnson, a former Governor of New Mexico, who ran on the Libertarian ticket. As of this writing Roemer has not officially announced a 2016 candidacy for president. Jill Stein ran as the Green Party's 2012 presidential candidate. She received 456,169 votes in the General Election. In June 2015 Stein announced her candidacy, again as the Green Party candidate, in the 2016 presidential election. Among the Green Party slogans for 2016 are "A New Society. A New Economy. It's In Our Hands" and "Greater Good, Not Lesser Evil." The Green Party was officially founded in 2001 as a national political party. Lisa Murkowski, a Republican, was appointed to the U.S. Senate in 2002 and elected to that office for a full six-year term in 2004, and re-elected as a write-in candidate in 2010. Prior to that time she served in the Alaskan House of Representatives. Murkowski is only the 32nd. woman to serve in the United States Senate since its founding in 1789. Murkowski did not seek the 2016 Republican nomination. Bernard "Bernie" Sanders, an Independent who in the past has described himself as a "Democratic Socialist," was elected to the United States Senate from Vermont in 2006. On April 30, 2015 Sanders announced his candidacy for the 2016 Democratic Presidential nomination. The "Feel the Bern" button depicted on this page was acquired at a 2016 Sanders for President rally in New York City. Additional information on Sanders is found elsewhere on this website. Gary Earl Johnson was elected Governor of New Mexico in 1994 and served in that capacity from 1995 to 2003. Johnson was at that time a member of the Republican Party. Gary Johnson announced his candidacy for the Republican nomination for President in April 2011. Unable to gain significant support, he withdrew his candidacy for the Republican nomination and later that year joined and sought the Presidential nomination of the Libertarian Party. Gary Johnson won the Libertarian Party nomination for President in May 2012. Johnson is again seeking the office of President of the United States in 2016 as the Libertarian Party candidate. His Vice-Presidential running-mate is William Weld, the former Republican Governor (1991-1997) of Massachusetts. Rafael "Ted" Cruz, a Republican, was elected to the U.S. Senate from Texas in 2012. As indicated on the button, Cruz enjoys wide-spread support among the Evangelical Christian community. He announced his bid for the 2016 Republican presidential nomination in March 2015. Additional information on Cruz is found elsewhere on this website. Hillary Rodham Clinton was elected to the U.S. Senate from New York in 2000 and served as Senator from 2001 to 2009. She made an unsuccessful bid for the Democratic Party's nomination for President in 2008, losing to Barack Obama. Hillary Clinton announced her candidacy for the 2016 Democratic nomination in April 2015. 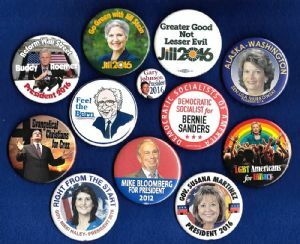 As indicated on the button, Clinton seeks support among the Lesbian, Gay, Bisexual and Transgender (LGBT) community. Additional information on Clinton is found elsewhere on this website. Nikki R. Haley, a Republican is the daughter of Indian immigrants. She was elected Governor of South Carolina in 2010 and re-elected to that office in 2014. Prior to that time she served in the South Carolina House of Representatives from 2005 to 2011. Haley is the second Indian-American Governor in the country, behind Bobby Jindal of Louisiana. Haley did not seek the 2016 Republican nomination for President, but as of this writing (Spring 2016), is among those being considered as a potential vice-presidential candidate. Michael Bloomberg, a Republican, was elected in 2001 to the office of Mayor of New York City. He served three terms holding that office from 2002 to 2013. In 2012 he was widely considered to be a possible candidate for the Republican presidential nomination. Bloomberg declined to run. Again in 2016, Bloomberg had been considered as a possible alternative to some of the Republican candidates seeking the 2016 presidential nomination. In this case there was some discussion as to his possibly running as an independent or third party candidate. In March 2016 he formally announced he would not be seeking that office. Bloomberg is a billionaire businessman and philanthropist. Generally speaking, he is considered a moderate who is somewhat liberal on social issues, but is also regarded as a fiscal conservative.